Nearing his 85th birthday on April 16 and, three days later, the seventh anniversary of his election to the throne of Peter, Pope Benedict XVI—even after so many years—apparently remained something of an enigma for many people. A small but telling incident before Easter may hold a key to understanding this unusual man. In case you missed it, here’s what happened. Contacted for reaction by the Associated Press, a leader of the group greeted the papal remarks dismissively. Although “listening with interest,” said Monsignor Helmut Schuller, he took the words only as questions, not an invitation to halt and desist. From the start, it’s often been that way for Benedict XVI. Almost his first act after becoming pope was to meet with Father Hans Kung, the Church’s most prominent dissenter and a bitter personal critic of the former Cardinal Joseph Ratzinger when he was prefect of the Congregation for the Doctrine of the Faith. Benedict was his usual gentle, cordial self. Father Kung apparently was friendly, but he hasn’t budged an inch since then. That has several explanations. The difference between the job descriptions of pope and CDF prefect accounts for part of the perceived transformation, from the Ratzinger that was to the Benedict that is. Part of it also lies in his enemies’ campaign to discredit the Ratzinger name during his CDF years. But something else also is operative. As pope, Benedict is highly sensitive to the pastoral dimensions of his ministry. Crackdowns are few and far between. Like the professor he is at heart, he speaks the truth of the gospel as he sees it–clearly, persuasively, with entire sincerity—hoping listeners will respond in like manner. For a man of lesser faith, the disappointments and rebuffs would be discouraging. 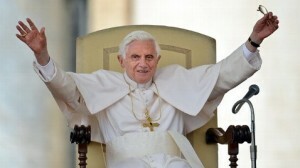 But Pope Benedict at 85 plainly has his eye on the future. The projects he’s pushing these days —- the New Evangelization, the Year of Faith -— are aimed at the long-term renewal of the Church, and it’s hardly likely he’ll be around to see it happen. But so what? In God’s providence, all will be well in the end. Do you doubt it? Universal grandfathers don’t.